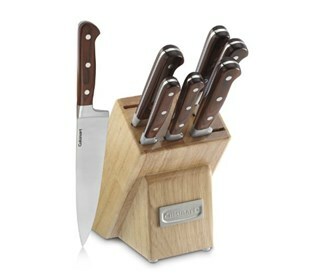 The Cuisinart C77PW-8PB is a 8 piece cutlery set with an elegant wooden block. The cutlery comes precision tapered ground blade surfaces, unique textured handles and innovative knife styles and block style. The stainless steel rivets secures the full-tang blade to the ergonomically designed handle. The Cuisinart 8Pc Cutlery Set With Block has many exciting features for users of all types. The Cuisinart 8Pc Cutlery Set With Block is sold as a Brand New Unopened Item.